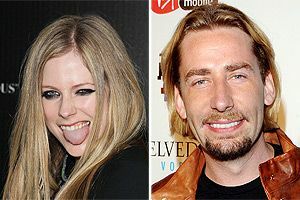 Congratulations to my new favorite celebrity couple, Avril Lavigne and Chad Kroeger, on their surprise engagement and forthcoming nuptials! Way to invent a horrifying dual ticket to rival Mitt Romney and Paul Ryan! I guess that rumor about Avril hooking up with Marilyn Manson this summer was just a smoke screen, and Avril’s fervent denial was the truth. We now know that secretly she was already participating in the greatest Canadian love story since McGosling. Kroeger and Lavigne are both hugely successful, tremendously mockable, and more influential than you might want to think. Like a lot of Canadian pop acts that cross over into the American mainstream (Guy Lombardo, Paul Anka, Drake, Alanis Morissette, Celine Dion, Arcade Fire, Justin Bieber), they have a certain unshakeable corniness. Earnestness can be so histrionic that it feels embarrassing and false. Avril’s first few singles were perfect mall-pop, and I’ve been known to YouTube “What the Hell,” from her most recent album Goodbye Lullaby while I’m folding laundry. There are absolutely no good Nickelback songs, but at least there are hilarious, sleazily ham-fisted ones like “Something in Your Mouth.” I eagerly anticipate the musical fruits of this union, and if they make any children, I look forward to seeing them in the tabloids in Megadeth onesies from Hot Topic. This will be Avril’s second trip down the aisle, having divorced first love and fellow TRL mainstay Deryck Whibley of Sum 41 in 2009. I can only imagine the last days of the Whibley-Lavigne marriage going down like a pop-punk Revolutionary Road. She was last linked with Kim Kardashian’s step-brother, The Hills‘ Brody Jenner, and her six-month courtship with Kroeger seems like a rebound gone nuclear. No matter how many rings she stacks up or womanly makeovers she undergoes, Avril will live permanently in our minds as the bratty teen who sang “Sk8r Boi,” forever a cocky flat-ironed poseur punk from Napanee wearing a wife-beater with a necktie. Chad Kroeger has been chugging along with Nickelback, founding a vanity record label and branching out into production. Nickelback are commonly described as “post-grunge,” which is a nice way to say lots of guitar crunch and yelling without a single poutine curd’s worth of coolness to show for it. Nickelback have sold 50 million albums worldwide and are trying to evolve their image from nu-metal bar band into a touring hard-rock behemoth more like Metallica. Somehow there were no pictures or rumors to tip us off about Avril and Chad. Or maybe it’s just that nobody was checking for either Kroeger or Lavigne all that hard? But still, in this age of nonstop celebrity surveillance a surprise engagement is something of a coup. Add the union of these two crazy blond Canucks next to health care and hockey on the long list of Canadian things that Americans selectively care about at times. For their celebrity couple name I propose Nickelb8er.